There has been a long debate on whether the best Cendol (otherwise spelled as Chendol or Chendul) comes Melaka or Penang. For me, the winner still goes to the original Penang Road Cendol. What's a trip to Penang without the Penang Road Cendol? You can't believe it, but my Dad and I love it so much that we could have it everyday when we are in Penang. Yes, it's unhealthy, but how often do we travel to Penang? Although Cendol has become a common form of dessert in Singapore, I can't find the perfect one after tasting this one. This authentic Penang Cendol is located in a side lane call Lebuh Keng Hwee, off Penang Road. This street stall history dates back as early as my Dad's childhood days. Apparently the stall has been around since 1945. There are two stalls in the lane. There are many stories on the competition between the two. But the winner is clear and evident from the queue. Even the colour of the Cendol of the winner stall looks more appetising. With the success, you may be expecting this in a shop, or at least coffee shop, but no, this authentic stall still operates in a push-cart stall. 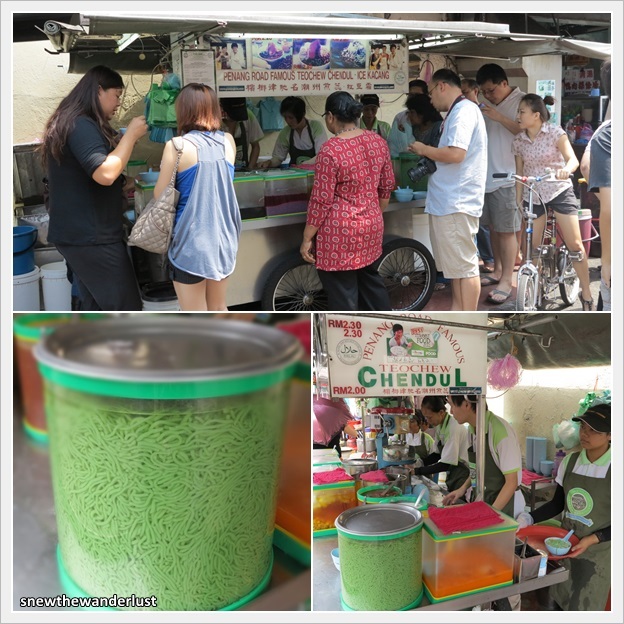 You can either choose to stand on the street to have your bowl of Cendol, or order it into a coffee-shop just slightly down the street (middle of the street, same side as the stall) to enjoy it in the comfortably seated. I believe this coffee-shop belongs (or rented) to the cendol owner as it's all decorated with photos of celebrities visiting the fame stall. Do note that there is also another coffee-shop located at the start of the street. Do not go to this coffee-shop just to have your cendol as they will charge you 20cents more to have your cendol inside there, which also serves other food. There is also a cendol shop that is at Komtar Walk, just a few steps away from Komtar (located from the linked bridge down Komtar) and this original stall at Lebuh Keng Kwee. I was told it belongs to the same owner. Mainly targeted to the tourists and tour groups, the shop have seats in an air-conditioned and nicely decorated cafe environment. Believe that the pricing would be higher as well. For us, we still prefer the original authentic stall. We didn't even give it any chance of trying it even though it's just a few more steps away. Psychologically, I believe that the original stall is still the best. There is so much comparison between Cendol from Melaka and Cendol from Penang. The conclusion winner still goes to Penang Cendol, and particularly, this stall in Penang Road. Although they taste similar, but Cendol in Melaka has the rich taste of gula melaka and coconut milk, taking after the Nonya Peranakan taste. Penang Cendol also has Gula Melaka syrup in it, it doesn't have the over-powering sweet taste, and the coconut milk just make it perfect combination.